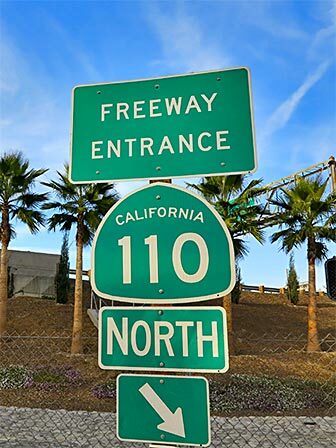 Freeways in Los Angeles are often referred to by name, rather than number. On news traffic reports, and when someone gives you directions, they might refer to a freeway by its name. Following is a list of names of freeways in Los Angeles. 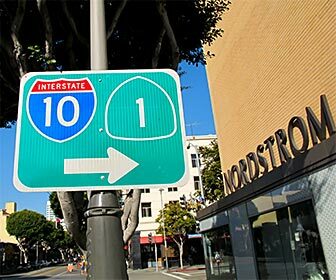 Carmageddon - this refers to events in 2011 and 2012 during which the 405 freeway was closed for an entire weekend. The event involved quite a bit of PR and warnings from Cal Trans (road crews) and was dubbed "Carmageddon" by the local media. 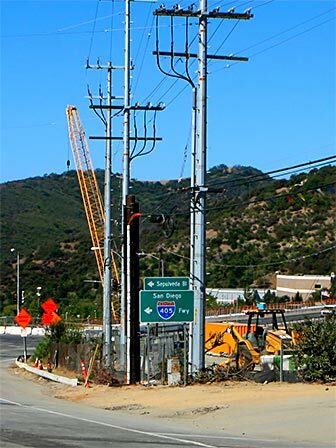 Cahuenga Pass - This is where the 101 freeway goes through the Santa Monica Mountains to join Hollywood and the eastern San Fernando Valley (Burbank area). The Hollywood Bowl and the Ford Theatre are in Cahuenga Pass, while Universal Studios is nearby. El Toro "Y" - the southern convergence of the 5 and 405 freeways (in Orange County). There is typically always traffic here (especially in the southbound direction toward San Diego), and more so during Rush Hour. There is not a nickname for the northern convergence of the 5 and 405 freeways (in the San Fernando Valley). Traffic does back up a bit on the northern convergence, especially in the evenings. However it is not nearly as bad as the southern section. Orange Crush - this refers to an interchange in Orange County. It is the convergence of several popular commuter routes, including Interstate 5, plus State Routes 22 and 57. It is also near Anaheim Stadium. During Rush Hour, and when there is an event at Anaheim Stadium, the Orange Crush becomes quite crowded. Rush Hour - as in many other large cities in the world, "Rush Hour" refers to the times of day in the mornings and evenings when a large number of people are commuting to or from work, resulting in extra traffic and slower commute times. In Los Angeles, the times are approximately 7AM-10AM and 4PM-7PM. Sepulveda Pass - This is where the 405 freeway goes up and over the Santa Monica Mountains to join West L.A. and the San Fernando Valley. The Getty is in Sepulveda Pass.